Sometimes I love a quilt pattern enough that I want to try it again, mixing it up the second time. 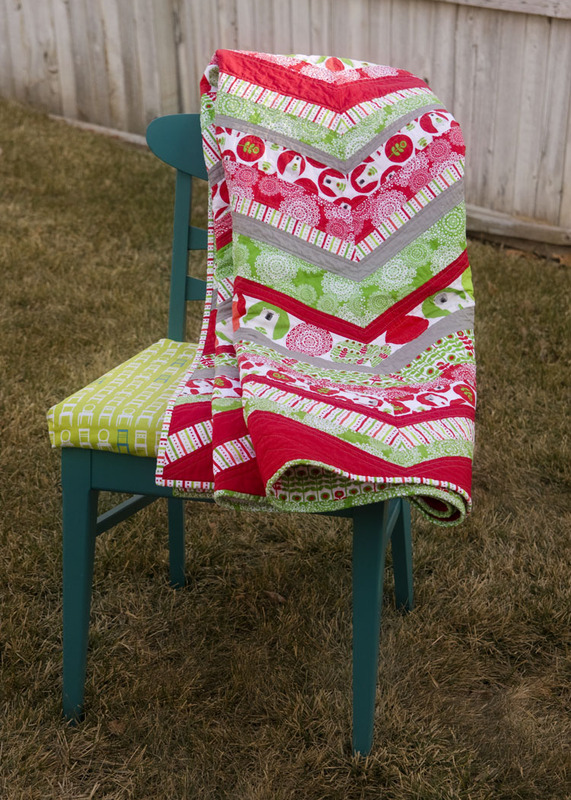 While I was in the middle of my scrappy chevron quilt, I decided to cut my Brrr fabrics and make a second chevron quilt with the red and green fabrics. When Laurie Wisbrun asked if she could send me some of her new fabric to play with I was flattered and a bit overwhelmed. I wanted to come up with something that was my style while showing off these fun prints. I really like how it came out. 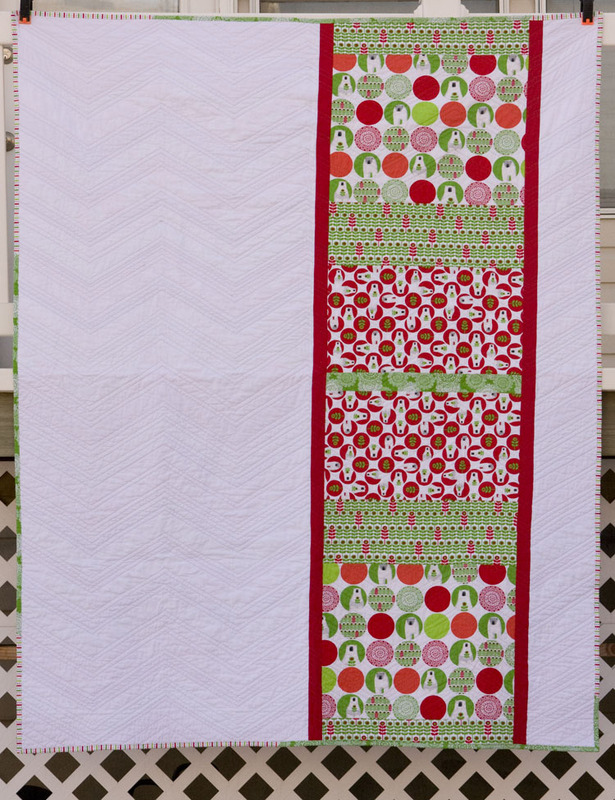 I think this quilt pattern is one of my new favorites. The quilt size is about 63" x 80" after shrinkage. I wanted to stick almost exclusively to the fabrics Laurie sent. I received 1 yard of each print--six prints total in this color way. I only used a 1/2 yard of the red snow flakes because I wanted to save the other 1/2 for my project I have in mind for the red/blue colorway. The only additional fabrics I added were Kona Cardinal, Kona White, and Pure Elements in Ash. I designed the back such that I could use all my leftover fabric. I wanted to leave some of the prints quite large so you could really see them. 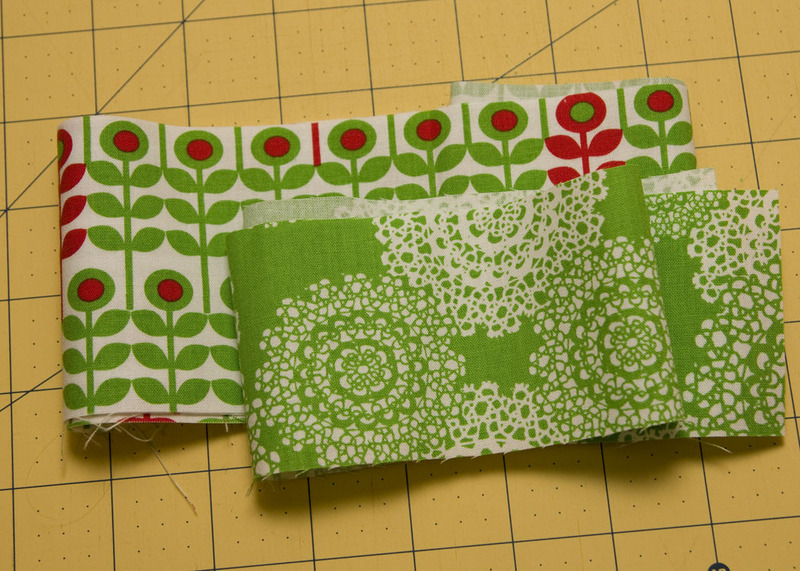 For the binding, I used 4 strips of the stripe fabric and 3 strips of the green snowflake. I've never cut it so close on a binding before. I cut 1/2" off my binding strip before sewing it up. It was almost the perfect length. I quilted this in a grey thread. I simply stitched on either side of each seam, following the chevron design. Of those 5 1/2 yards, this is all I have left. I felt pretty happy about using it all up in a quilt that will be loved. Thanks so much Laurie for giving me this chance! I had a lot of fun with your fabric! It turned out fantastic. Very fun and bright! I really love the chunks on the back too. Of course I always love the backs of your quilts. I love this quilt so much. It look great they way the colours kind of clash but go together at the same time. LOVE it Kati! 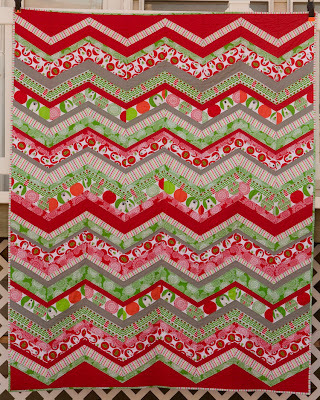 The pattern and the prints work so well together :-) It looks like candy canes! That looks amazing Kati! LOVE that chevron, this is on my to do list for sure!! I love that! Great job! such a perfect design for this! very, very cute Kati! That is lovely!! Such a striking quilt! SOOOOOO cute! 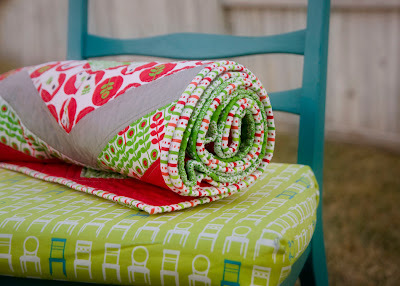 What a great use of such fun fabric! That is a s-s-super cute quilt! Those polar bears are pretty freaking adorable. 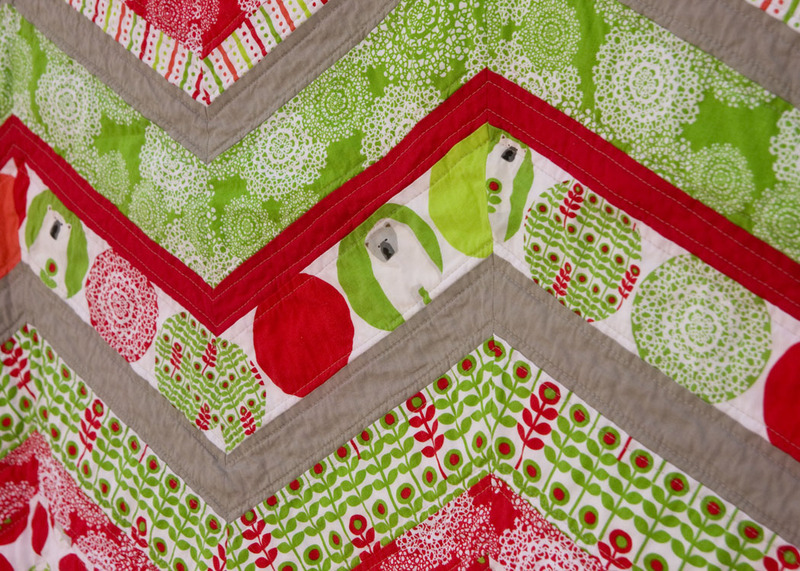 Is this the same pattern as you used in the Scrappy Chevron Quilt? It looks a bit different but perhaps it's just the colors. I LOVE this colors and the fabrics. How wonderful to have gotten all those fabrics to play with! 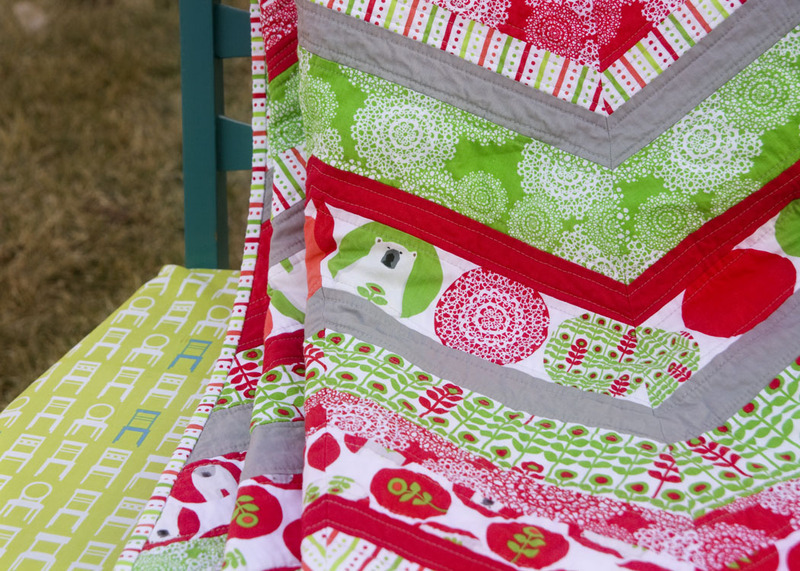 Do you have a pattern for this quilt? Love it! What a great pattern and I love the fussy cutting with the bears. Great job! Absolutely love it! What great cheerful colors and a great pattern to show them off. I came via pinterest. 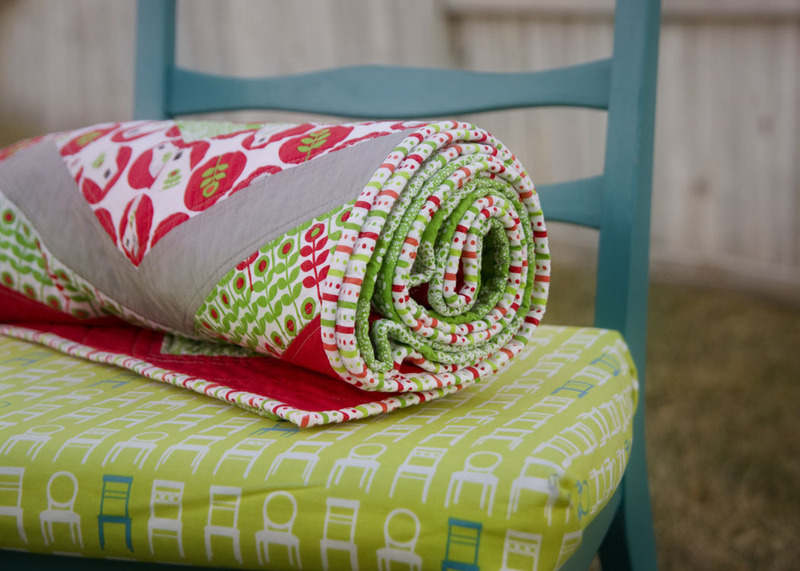 Ooh, Kati, you are a lucky duck to get those adorable fabrics! I love the chevron. It's nice to see how the look changes with a different color scheme. Kati, you're officially AMAZING!! Another beautiful, well crafted finish!! Kudos to you and that super cute Laurie Wisbrun line!! It's a perfect pattern to show off the prints! Well done! 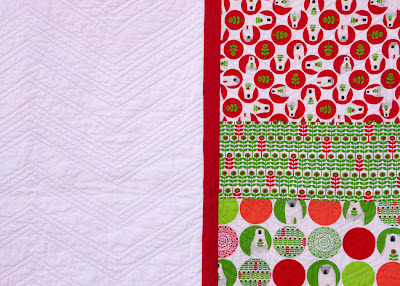 My quilt backing is very similar (just had to use all of those adorable polar bears). Totally perfect Kati, like the most awesome mountain range ever! I love it! It's wonderful!!! This is so adorable! And it's settled--I must make a chevron quilt! Very very "you" and very very wonderful! I gasped when I saw it. It's so beautiful! 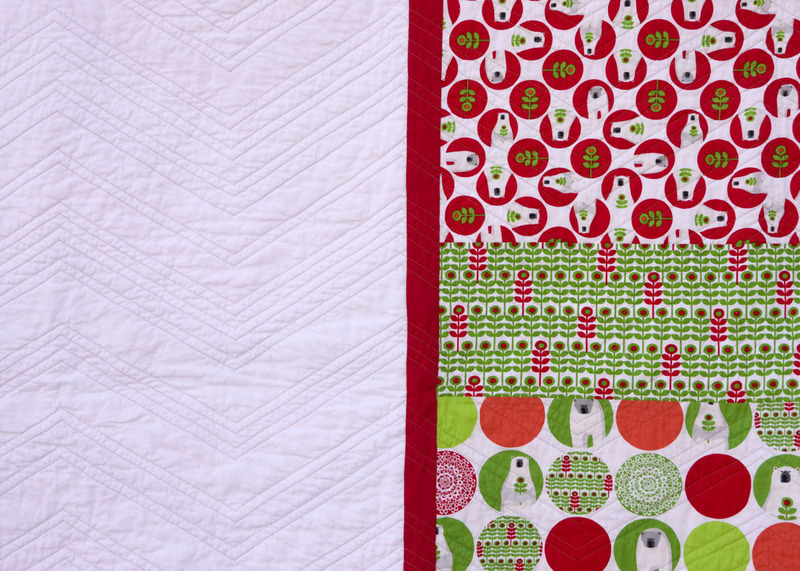 Kati, you're amazing as always and starting to inspire me to want to try this kind of quilt! Beautiful! Love the pattern you used. It really showcases the fabrics! 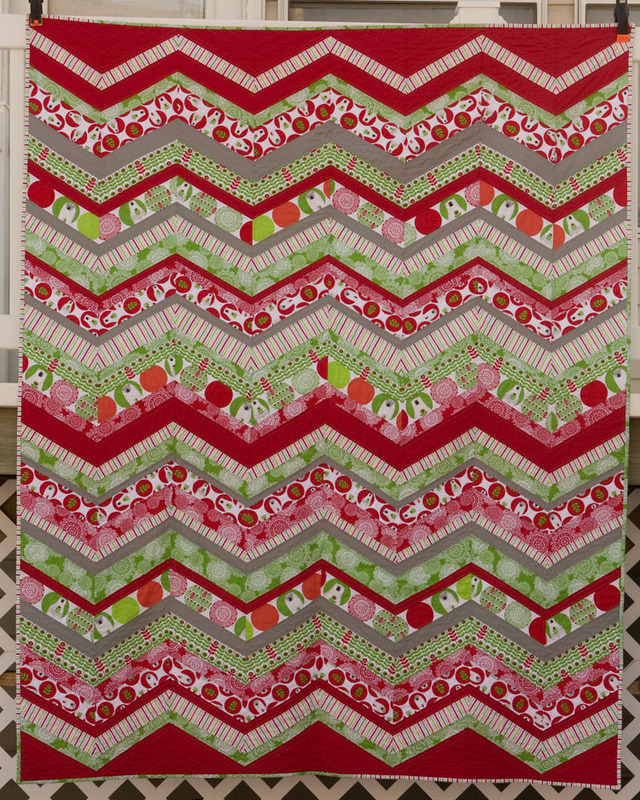 I love the chevron quilt! I will have to find a tutorial or pattern to make my own. I am almost done quilting my zig zag quilt... You sure do make some cute quilts! Wow I love how you made these colors work together. Beautiful! can you address the specifics of this quilt~ (vs. the scrappy chevron) and how you got the horizontal fabrics to line up perfectly in each chevron? you must've cut each fabric a certain width? ie: the green snowflake fabric 2 1/2 ", the red kona 1 1/2" etc? how did you make each (vertcal) section a perfect duplicate/repeat of each other? and, your vertical seams match up so perfectly??! i guess my questions focus on the construction of the quilt...hope they all make sense! i love the quilt by the way!! I am totally smitten by this quilt. It's fabulous. Was there a pattern or a special ruler you used? Such great fabrics too. Lucky you to get to play with free fabric :)!